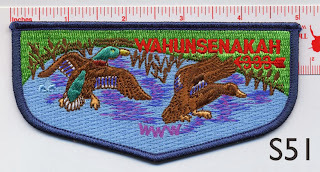 Unless you were watching very closely, you may have missed the latest new flap issue from Wahunsenakah Lodge 333. Released at the Fall Fellowship, the new fully embroidered S51 issue is virtually a twin of the S2 service flap which has been around since the Lodge was established in January of 1996. The classic design is the same, but the size is noticeably bigger. While there were many loom runs of the S2 over the past 17 years, resulting in many minor variations, they were all essentially the same size. 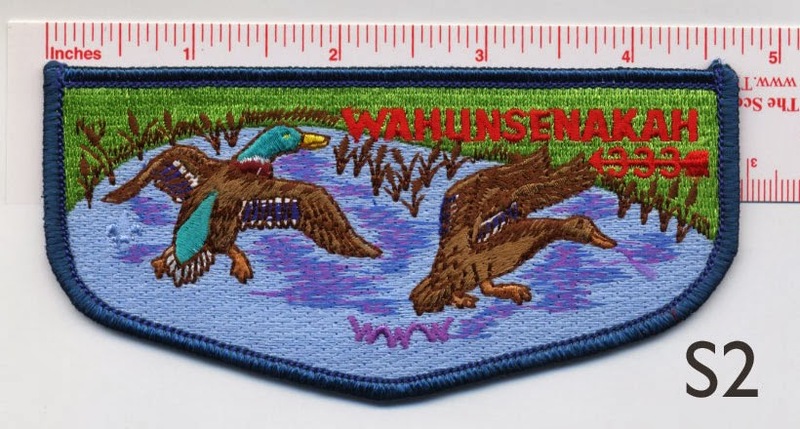 When the latest reorder of the Wahunsenakah service flap was received Lodge collectors quickly noticed that the new patches were both wider and taller than any previous order. Dr. Barry Green, Insignia Design Advisor for Wahunsenakah, spoke with Kelly Williams of the Krelman Company, manufacturer of the Lodge 333 flaps, and learned that the patches were enlarged to comply with new National regulations that specify a 5" width. The original S2 flaps were 4 5/8" wide. 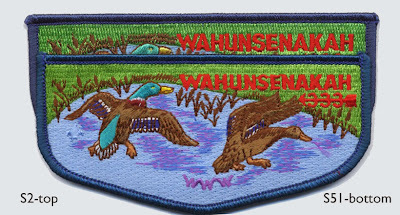 To accommodate the larger size the design components of the patch were enlarged, including the lodge name and number lettering, FDL, and reeds in the water. The increased size of the ducks makes the white tips of the blue feathers much more prominent. There are also evident color differences in the red and green areas, as well as a more blue appearance of the border rather than the teal of the S2. Dr. Green pointed out that the intent was not to make a new "issue," but to comply with the directive from National to meet the new guidelines. 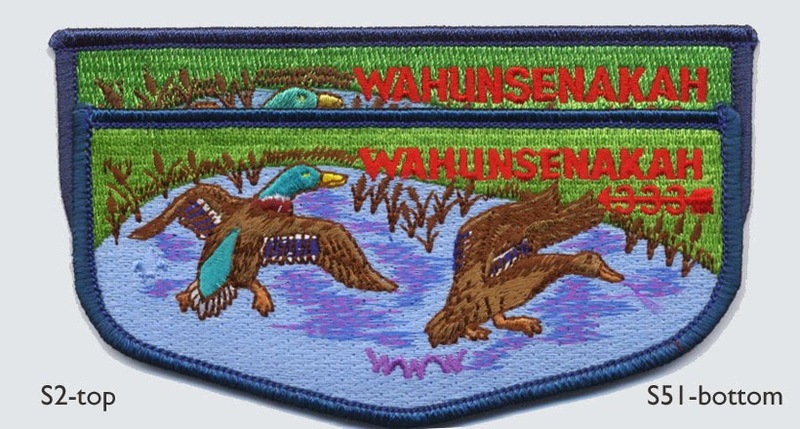 After collaborating with Trading Post Advisor Larry Johnson and noted collector Rob Kutz, Dr. Green confirmed that the changes to the service flap were so significant as to merit classification as a new issue, so it is now considered S51. It will be interesting to see how many new issues from other Lodges will be created by the new flap size guidelines. Below are some additional pictures that illustrate the comparative size differences between the smaller S2 service flap and the new larger S51 issue.